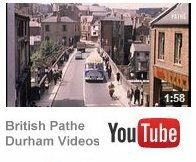 Came across these Cine-Vids the other day, not quite Ushaw Moor but still Deerness Valley – Anyone fill in the gaps ? BRADSHAW’S 1922 railway timetable, which no home should be without, records that there were nine trains a day in each direction on the five-and-half-mile line between Durham and Waterhouses, calling at Ushaw Moor only. On Saturdays, in an attempt to ensure that the lads got home all right, an additional train left Durham at 10.25pm. Whatever the gradient as the old Think-ICan laboured up the Deerness Valley, thereafter it was downhill all the way. Just one daily service steamed soporifically in each direction when finally the line closed to passengers – save for an annual outing to the Big Meeting – in October 1951. The goods service, pitmatic mostly, continued until 1964. The relevance of all this, of course, is that Saturday marked the first qualifying round of the FA Vase, the traditional starting station for the Backtrack column’s ever-optimistic Railroad to Wembley. READ MORE Railroad to Wembley starts at Waterhouses From The Northern Echo.